There is a large and growing need for a textbook that can form the basis for integrated classes that look at minerals, rocks, and other Earth materials. Despite the need, no high-quality book is available for such a course. 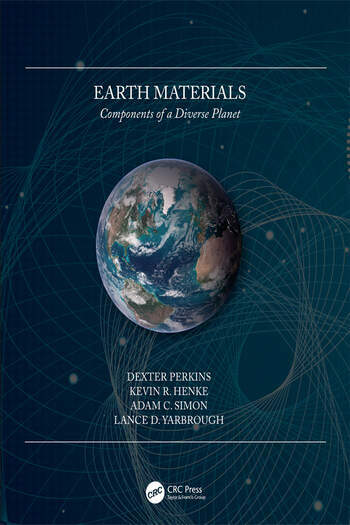 Earth Materials is a wide-ranging undergraduate textbook that covers all the most important kinds of (inorganic) Earth materials. Besides traditional chapters on minerals and rocks, this book features chapters on sediments and stratigraphy, weathering and soils, water and the hydrosphere, and mineral and energy deposits. Introductions to soil mechanics and rock mechanics are also included. This book steers away from the model of traditional encyclopedic science textbooks, but rather exposes students to the key and most exciting ideas and information, with an emphasis on thinking about Earth as a system. The book is written in such a manner as to support inquiry, discovery and other forms of active learning. All chapters start with a short topical story or vignette, and the plentiful photographs and other graphics are integrated completely with the text. Earth Materials will be interesting and useful for a wide range of learners, including geoscience students, students taking mineralogy and petrology courses, engineers, and anyone interested in learning more about the Earth as a system. Dexter Perkins is a Professor at the University of North Dakota, USA. He was an undergraduate at the University of Rochester before moving to Ann Arbor to attend Law School at the University of Michigan, USA. He subsequently transferred to Michigan's Department of Geology and received a masters and a PhD degree. He is presently (in 2019) in his 38th year at UND. Kevin R. Henke is retired from the Center for Applied Energy Research (CAER) at the University of Kentucky, USA. He obtained his M.S. in Geology at the University of North Dakota in 1984, and his Ph.D. at the same university in 1997. His interests range from topics such as metamorphic petrology, mineralogy and geochemistry. Adam Simon is Professor of Earth and Environmental Sciences at the University of Michigan, USA. He obtained his Ph.D at the University of Maryland in 2003. His fields of study are economic geology, igneous petrology and geochemistry. Lance D. Yarbrough is Assistant Professor of Geology and Geological Engineering at the University of Mississippi, USA, where he obtained his Ph.D. in 2006. His areas of expertise include engineering geology, remote sensing, and geotechnical engineering.